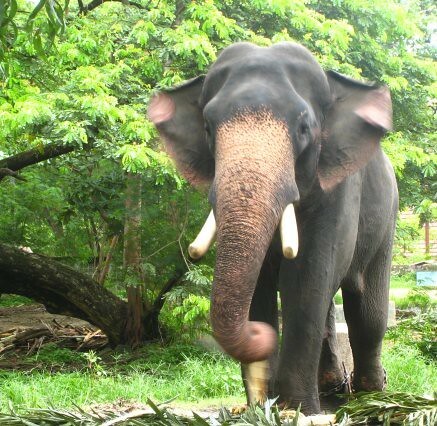 About 60 elephants, all belonging to Lord Sri Krishna of Guruvayoor, live in Punnathur Kotta located about 3 KM away from the temple. The 10 acre compound is open to public and you can watch them being fed and bathed. The elephants were donated by various devotees including Jayalalitha (The joke is that the elephant asked Jayalalitha, why me, why not you?). 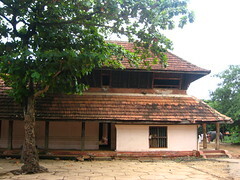 The compound also has a naalu kettu, a traditional rectangular home with a central courtyard, which belonged to the Punnathur Raja which as the two photos below show, remain in very poor condition. I was happy to see your writing on Punnathur Kotta. It is a beautiful building in a bad condition due to ill-maintenance. I had visited Punnathur Kotta in 2002 and 2006 and I could see it deteriorating due to neglect. 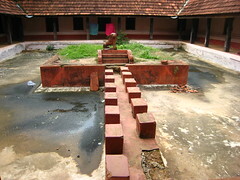 Many scenes in the epic malayalam movie “Oru Vadakkan Veeragatha” were shot in and around this bulding. Mahesh, considering the amount of money Guruvayoor Devaswom makes, it should be a trivial effort to maintain that place in a better way. With the airing of Gajarajan Guruvayur Kesavan on Surya TV, I don’t think there would be a dearth of visitors to Kunnathoor Kota. The management can have a paid entry into the premises so as to maintain the place very easily and beautifully. Can become an added religious vivit.